Explore things to do, places to visit, best time to visit, how to reach, history & culture of Agra to plan your trip. Agra has three UNESCO World Heritage sites, the Taj Mahal and the Agra Fort in the city and Fatehpur Sikri nearby. There are also many other buildings and tombs from Agra’s days of glory as the capital of the Mughal Empire. Due to the very high number of tourists, Agra is a breeding ground for touts and people looking to separate you from your money. People from all over the world visit Agra to see India’s most famous building – the Taj Mahal. While Agra’s golden age was as the capital of the Mughal empire between 1526 and 1658, the city was founded much earlier. The earliest reference to Agra is in the ancient epic, the Mahabharata, while Ptolemy was the first person to call it by its modern name. The recorded history of Agra begins around the 11th century, and over the next 500 years, the city changed hands between various kings, both Hindu and Muslim. In 1506, Sultan Sikandar Lodi, the ruler of the Delhi Sultanate, moved his capital from Delhi to Agra. His son Ibrahim Lodi was the last ruler of the Lodi dynasty, as he was defeated in 1526 by Babur, the first Mughal ruler, in the battle of Panipat. Agra fell too, and became the capital of the Mughals, whose rule over Agra was uninterrupted except for a brief period between 1540 and 1556. In 1540, Sher Shah Shuri overthrew Humayun and became the ruler of much of Northern India, including Agra. After Sher Shah Suri’s death, his descendants proved unequal to the task of ruling the kingdom. Hemu, a Hindu who served as one of Suri’s generals, became the effective ruler. Hemu would later crown himself King Hemachandra Vikramaditya just as the kingdom was facing an assault from the reinvigorated Mughals. In 1556, Hemu was defeated and killed in the second battle of Panipat, and the Mughals took back the city of Agra. Mughals were great builders. Babur built the Aram Bagh (Garden of Relaxation) which was modeled after the garden of paradise and was where he was buried after his death. His grandson Akbar refurbished the Agra fort and built Fatehpur Sikri, an entire city just on the outskirts of Agra. He also renamed Agra after himself, and the city was known as Akbarabad while it was in Mughal hands. 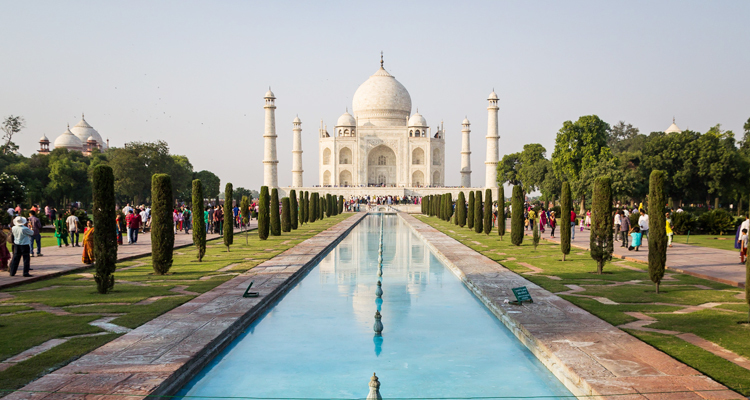 Akbar’s grandson Shah Jehan would give Agra its most famous monument, the Taj Mahal, which he ordered constructed as a mausoleum for his most beloved wife, Mumtaz Mahal. The Taj is constructed in white marble. It took 20 years to construct, and is now universally known as a monument of love. Legend has it that Shah Jehan wanted a replica of the Taj constructed in black marble that would be his final resting place. There is no actual support for this theory, but even if it were true, it would have unlikely been built. His son Aurangzeb was austere and pious, and had no time or inclination for the ostentation of his forefathers, preferring to spend his money on wars in South India. In any case, even during Shah Jehan’s reign, which was the period when the Mughal empire was at its height, the construction of the Taj put a strain on the resources of the empire and caused a famine around Agra. Shah Jehan was eventually buried in the white Taj, next to his beloved wife. In addition to giving Agra its greatest building, Shah Jehan was also responsible for the city’s decline, when he decided to shift his capital to Shahjehanabad, now known as Old Delhi, in 1658. Though Aurangzeb ordered a move back, this too was short lived, as he moved his headquarters down south to Aurangabad to focus on his wars in the south. Agra declined and so did the Mughal Empire. The city was eventually captured by the Marathas, who renamed it back to Agra. In 1803, it came under British rule, who established the Agra Presidency there. When India regained its independence, the city was incorporated into the state of Uttar Pradesh, and was not even made the state capital, which went to Lucknow, further east. Agra is now a tourist town, known most famously for the Taj Mahal, Agra Fort and nearby Fatehpur Sikri. Taj Mahal, Sheer poetry in marble. Majesty and magnificence, unrivalled. The Taj Mahal, the one and only one of its kind across the world. The monumental labour of love of a great ruler for his beloved queen. The ultimate realisation of Emperor Shah Jehan’s dream. From 1631 A.D., it took 22 years in the making. An estimated 20,000 people worked to complete the enchanting mausoleum, on the banks of the Yamuna. For a breathtaking beautiful view of the Taj Mahal, see it by moonlight. The Agra Fort: The great Mughal Emperor Akbar commissioned the construction of the Agra Fort in 1565, A.D. although additions were made till the time of his grandson Shah Jehan. The forbidding exteriors of this fort hide an inner paradise. There are a number of exquisite buildings like Moti Masjid – a white marble mosque akin to a perfect pearl; Diwan-I- Am, Diwan-I-Khaas, Musamman Burj – where Shah Jehan died in 1666 A.D. Jahangir’s Palace; Khaas Mahal and Shish Mahal. Chini Ka Rauza: This was constructed by Afzal Khan – a high official in the court of Shah Jehan. Decorated by glazed tiles on the façade, the structure clearly depicts the Persian influence in architecture. Ram Bagh: One of the earliest Mughal gardens, it was laid out by Emperor Babar – the founder of the Mughal dynasty. It is said that Babar was temporarily buried here before being permanently interred at Kabul in Afghanistan. Sikandra: The mausoleum of Emperor Akbar represents his philosophy and secular outlook, combining the best of Hindu and Muslim architectures in a superlative fusion. Completed in 1613 A.D., it is a well-preserved monument. Itmad-ud-daulah: This exquisite marble tomb was got constructed by Emperor Jehangir’s queen, Nurjahan, for her father Mirza Ghiyas Beg during 1622 – 1628 A.D. The craftsmanship at Itmad-ud-Daulah foreshadows that of the Taj Mahal. It was here that ‘Pietra Dura’ the inlay work on marble – so characteristic of the Taj – was first used. Mariyam’s Tomb: This unique tomb in red sandstone was built in 1611 A.D. in memory of Emperor Akbar’s Goan-Christian wife – Mariyam. The tomb has some exceptional carvings. Jama Masjid: This building, with a rectangular open forecourt was constructed in 1648 AD by Shah Jehan’s daughter, Jehanara Begum in memory of the famous Sheikh Salim Chishti and his grandson Islam Khan. Of particular importance is its wonderful assimilation of Iranian architecture. Agra’s Kheria Airport is located at a distance of 12.5 kilometers from the city center. The airport is a seasonal commercial airport which serve only Air India flights from New Delhi. It normally takes an hour to reach Agra from New Delhi by air. Taxis are easily available and will take you to your hotel or any other tourist destination you want to reach. The beautiful, historical city of Agra is easily accessible by road and has four main railway stations-the Agra Cantonment, Agra Fort, Idgah Agra junction and Raja ki Mandi. The stations are well connected to major cities and tourist locations in India. Moreover, some superfast trains are also available that connect Agra to Kolkata, Delhi and Mumbai. Taxis, cabs and rickshaws are easily available to carry travelers to their destinations. Agra can be conveniently accessed by bus from all the major cities and locations of India like Delhi, Lucknow, Kanpur and Gwalior etc. Agra city has two major bus terminals-The Idgah Bus Stand and the Interstate Bus Terminus (ISBT). You can also opt for self-drive or rent a cab.